This timber has much fewer and smaller knots than the 5th Softwood, especially within smaller sizes as shown. 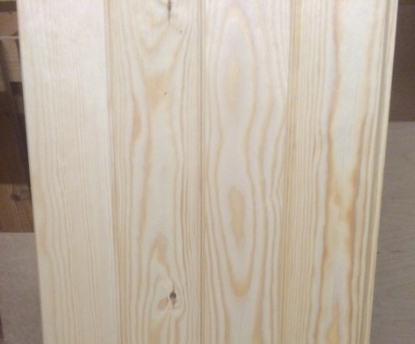 Wooden garage doors or gates manufactured using this timber are ideal for painting or staining. Doors and gates constructed using joinery grade timber are normally traditional through mortise and tenon construction with a timber dowel through stiles, although smaller single doors and gates are stub mortise and tenon with a timber dowel through stiles. Ledges and braces are stop chamfered adding a really nice feature to the inside of the wooden garage doors or gates. An ovolo or another moulding on the glazing bars for glazed wooden garage doors is another feature which isn’t on the paint grade doors. Wooden garage doors and gates produced in this timber are base coat treated with clear wood preservative , ready for a finish of your choice as per the manufacturers instructions. Click on links below to view examples of Wooden garage doors and gates produced in Unsorted joinery grade Redwood Softwood.